I realized just yesterday that I have too many impulse buys in my closet. You know the kind, super-cute-had-to-have but it doesn’t really go with anything and it ends up sitting in your closet, tags still on. 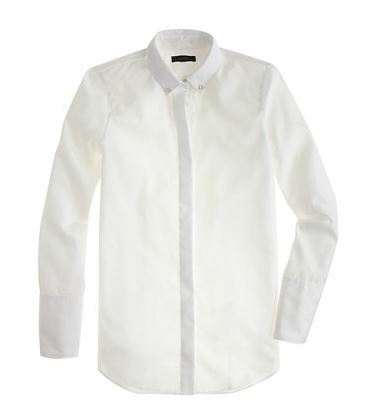 I realized what I really need are more classic, versatile pieces like a crisp white button-down shirt. Only I can’t bring myself to spend $$ on a boring white shirt, so I’ve been looking for the perfect one. I already have the Perfect Shirt from J.Crew and I’m not a huge fan of the stretchy, shininess of it. The Boy shirt didn’t get great reviews. Then I saw this beauty — little cute details like a pique collar and silver buttons make this a standout, not to mention the glowing reviews about fit. Now only $59.99, with extra 30% off. Get it here. Chambray shirts are like the casual version of the white button-down. Versatile, matches a lot, classic, but so much more laid-back. It’s a no-brainer to add to your wardrobe if you don’t already have one, and out of all the colors and styles, this one is my favorite. Others seem to agree with me, as this got glowing reviews. 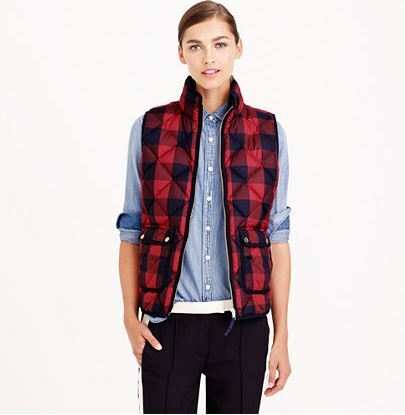 PS have to admit originally wanted one as I’m obsessed with red/black plaid and it looks great with chambray, aka I knew I was going to get this excursion vest below and needed a chambray shirt to match. Hehe. 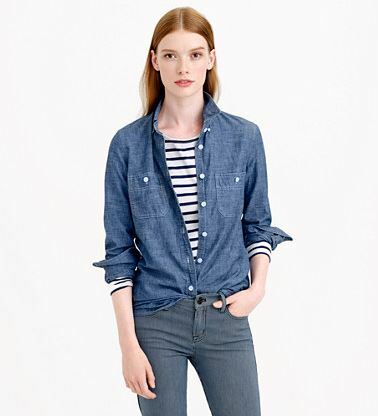 Anyway, get this chambray shirt here on sale for $88, with extra 30% off now. I love red/black buffalo plaid. And gold buttons. Anyone who has read my posts before most likely already know this about me. This vest combines both, so of course I was immediately drawn to it. This vest paired with chambray and a cute wool skirt plus boots = quintessential cozy chic for winter. My only hesitation? This is kind of a pop item, so it’s relatively hard to match my current wardrobe, since most of my tops are “pop” items that stand out and that I “had to have”…so this print may just clash with almost everything I own. However, I’m willing to stock up on some neutrals for this vest to work. Get it here for $138, now with extra 30% off. This sweater is a favorite of probably every J.Crew fan, who all own this sweater in multiple colors. It’s a no-brainer to stock up on whenever there’s a mega sale. It’s my go-to whenever I’m too lazy or tired to coordinate an outfit; just pick a color of this sweater, throw it on with a pair of jeans, and voila you’ll probably look appropriate for just about any occasion you’ll run into that day. The fit is comfortable, flattering, and it’s relatively warm. Not much more you can ask for. Prices range from $60 to $70 on sale, now with extra 30% off. Get it here. Of course I snagged this immediately when I saw there was a sale. I’ve only been obsessing over it forever. Most sizes were sold out when I checked, but apparently since I had my size saved in my cart, it let me check out anyway. Turns out hours later all sizes were back, so don’t hesitate to grab yours. I was a bit uncertain of sizing; I’m usually between a Small and a Medium at Madewell, and since this is oversized and runs large, I thought about getting a Small. But I wouldn’t want to kill the oversized intent of this shirt and have this be a fitted shirt; rather play it safe and have it fit than have it not fit, right? Hopefully I made the right decision. Get it here for $79.50, now with extra 25% off. I’m the biggest fan of my Madewell Transport Tote. After a long search for the perfect one (see post here), I’m in love with the one I ultimately received and it only gets better with age. So of course, I can’t help but be drawn to the mini, crossbody version of it; now I can carry my favorite bag with me everywhere, hands-free! The $148 price really is quite cheap for something of this quality and function, and definitely go for the $10 monogramming (go for the gold foil!). It really just makes this bag extra special. Get yours here. Two things I really wanted but were excluded from the promo — the J.Crew Chateau Parka and the Madewell Transport Weekender (TDF). In a way I’m relieved about the Madewell Weekender; I’m not sure I’d ever be willing to travel and really use a bag with that amount of gorgeous leather. What did you pick up during this sale? This entry was posted in J.Crew, Madewell. Bookmark the permalink. I was going to get the Madewell Mini Transport w/monogram but after reading your post about quality issues, I’m hesitant to potentially be stuck with a crappy quality one since I had it monogrammed. May just have to pick one up in store to pick the one I want, then have it sent in for monogramming. PITA…the things we do for bags!! The red plaid is the best for the season!